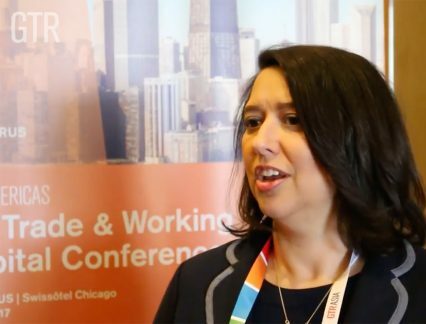 GTR spoke to corporates, banks and fintechs at the GTR US Trade and Working Capital Conference 2017 in Chicago, to enquire about the status of the trade digitisation process and what kind of assistance sectors need from each other. Jennifer Davidson, senior trade finance co-ordinator at Cargill, explains that the company’s biggest hurdle in implementing digital trade solution is to get everyone in the supply chain involved. In order to succeed, she believes a joint marketing effort between corporate, bank and fintech is necessary. At Bank of America Merrill Lynch, Ann McCormick, director of trade and supply chain product management, points out that a majority of the bank’s IT budget is directed at facilitating regulatory compliance, making it challenging to invest in other trade digitisation solutions. Still, the bank is starting to see partnership opportunities with fintechs but McCormick says these providers need to learn to listen to banks and come up with solutions to existing problems, as opposed to “pitching a whole bunch of solutions”. On the fintech side, Ian Kerr, CEO of Bolero, admits that fintechs have a responsibility to make trade digitisation a smoother process by making their solutions interconnectable.